Mr Jones of Manor Farm is so lazy and drunken that one day he forgets to feed his livestock. The ensuing rebellion under the leadership of the pigs Napoleon and Snowball leads to the animals taking over the farm. Vowing to eliminate the terrible inequities of the farmyard, the renamed Animal Farm is organised to benefit all who walk on four legs. But as time passes, the ideals of the rebellion are corrupted, then forgotten. And something new and unexpected emerges. . . Animal Farm - the history of a revolution that went wrong - is George Orwell's brilliant satire on the corrupting influence of power. Eric Arthur Blair (1903-1950), better known by his pen-name, George Orwell, was born in India, where his father worked for the Civil Service. An author and journalist, Orwell was one of the most prominent and influential figures in twentieth-century literature. 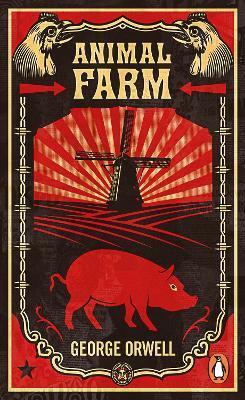 His unique political allegory Animal Farm was published in 1945, and it was this novel, together with the dystopia of Nineteen Eighty-Four (1949), which brought him world-wide fame. His novels and non-fiction include Burmese Days, Down and Out in Paris and London, The Road to Wigan Pier and Homage to Catalonia.